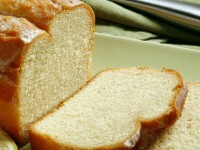 Pound Cake recipes are so named because they used to be made with one pound each of flour, butter, eggs and sugar. True pound cakes are seldom made today because of the expense and the work it takes to make a cake with one pound of each ingredient. Also, some new recipes replace the butter with vegetable shortening, and some of the eggs with milk and use baking powder. 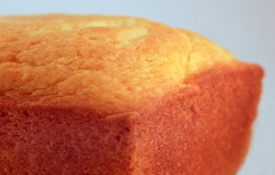 Pound cake recipes are made with a fat, either butter or a vegetable shortening. When baking a cake with a fat in it, grease the pans with a fat (unsalted preferably) and dust the pans with flour. Invert the pans and lightly tap the bottom of them to remove any excess flour. This leaves only a thin film of flour which adheres to the fat and helps to give the cake a smooth crust. When making pound cake recipes, the solid fat is first creamed with the sugar, which is added gradually. The mixture is then beaten until it has the consistency of whipped cream. Then, the eggs are incorporated into the butter-sugar mixture. The eggs are either beaten before adding, or are beaten one-at-a-time into the mixture. The dry ingredients are then sifted together and added to the creamed mixture in increments alternating with the milk or other liquid. Each addition is only beat about 10 seconds, just enough to incorporate it with the rest of the mixture. After all the dry and liquid ingredients are added, the mixture is beaten for about a minute. If the egg whites were beaten until stiff, they are now folded into the batter very gently. If it's difficult to control your oven temperature, or the cake contains only a small amount of fat, you should line the pans with a smooth paper. You can use waxed paper, brown paper, or parchment paper to do this. Cut the paper to fit the bottom of the pan, plus an allowance to cover the sides. Some recipes will only call for the bottom to be papered. For a rectangular pan, cut out the corners of the paper so that it will fit against the sides of the pan without wrinkling. For a round or oval pan, cut gashes along the edge of the paper as far as the part which is to cover the bottom. The paper will then overlap smoothly on the sides of the pan. Grease and flour the paper after it's fitted into the pan. The pan should also be greased before fitting the paper in, to help hold the paper against the pan. If you want the cake to rise to the top of the pan, fill the pan about two-thirds full. Spread the batter well into the corners and against the sides of the pan, leaving a slight depression in the middle. As the cake rises more at the center than at the edges, this will help to keep it flat on the top when it's done. Place the pan in the center of the lower rack. If the oven is too hot, a thick, brown crust will form on the outside before the inside has a chance to get done. This will make the top of the cake crack. When the cake is done it will shrink slightly away from the sides of the pan. If you touch it on the top with your finger, the cake should spring back; if your finger leaves a depression, the cake isn't done. You can also test the cake for doneness with a toothpick. Just insert the toothpick into the thickest part of the cake; if it comes out of the cake clean, with no wet batter on it, the cake is done. After the pound cake has completely cooled, you can either put pound cake glaze or pound cake icing on it. Or, leave it plain, if you prefer.